Thank you to everyone who donated generously to fund our scholarships this year. Our fundraising for our 2018 scholarships is complete, but if you’d like to donate to Sirens itself, please visit our donation page to see the types of support we can most use. In 2018, because of the generosity of the Sirens community, we are pleased to offer twelve scholarships across four categories: people of color, those submitting exemplary programming proposals, those with financial hardships, and librarians, educators, and publishing professionals. Please see our scholarships page for more information and how to apply. Sirens has a mission: to provide a welcoming space for our attendees to discuss the remarkable women of fantasy literature. As part of that mission, we specifically craft Sirens to include and amplify the many brilliant voices of our attendees. Our greatest hope is that these voices will represent both different perspectives—reader, scholar, educator, librarian, author—and individuals of different genders, sexualities, races, religions, and abilities. Each year, we invite the Sirens community to help make attendance possible for a number of individuals. As in past years, these scholarships will support people of color, those submitting exemplary programming proposals, and those with financial hardships. This year, we are also offering scholarships to librarians, educators, and publishing professionals. These perspectives are critical to our conversations, and these individuals sometimes find it difficult to attend without additional support. We are asking for your help! 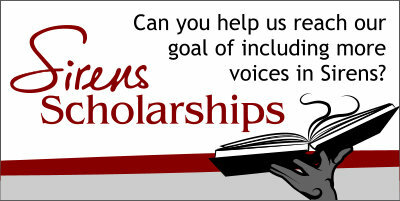 We want to provide twelve Sirens scholarships this year. To do so, we need to raise almost $4,400. That amount will provide a Sirens registration and a round-trip Sirens Shuttle ticket to each recipient. People sometimes say that money makes the world go ’round; we’d like to counter with the idea that generosity makes the world go ’round. Not all individuals who wish to attend Sirens can afford to do so, and you can help make Sirens a possibility for those who can’t. Sirens would like to award three selected recipients with a scholarship, in the hopes that this will enable them to attend Sirens in the fall. Recipients will be chosen randomly from those who seek assistance. Librarians, educators, and publishing professionals so often provide exceptional services to book-loving communities—and are, especially at the beginning of their careers or when working for underserved populations, so often paid poorly for their efforts. Therefore, this year, we would like to raise funds to allow one librarian, one educator, and one publishing professional to attend Sirens. Their work—and their voices—are critically important to our conversations.